In the summer of 1965, UK group Herman’s Hermits had just finished a big tour of America in Hawaii. 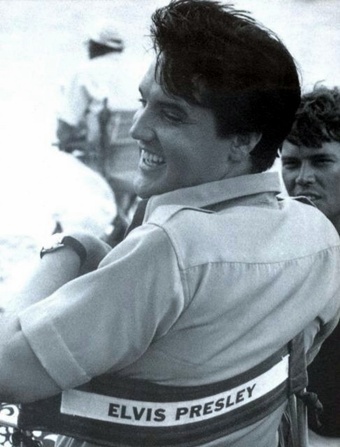 "We were booked to fly home the next day, but that night after the last show we got a telephone call from Colonel Tom Parker – and he said that Elvis Presley would like to meet Herman’s Hermits on his film set the next day. "Peter Noone and I managed to change our tickets home for a flight 24 hours later. Karl, Keith and Derek chose to fly home missing the chance of a lifetime." 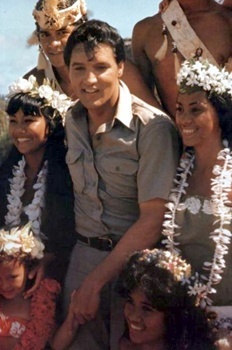 Elvis was filming Paradise Hawaiian Style. "We could see about 13 motor bikes side by side coming towards us. 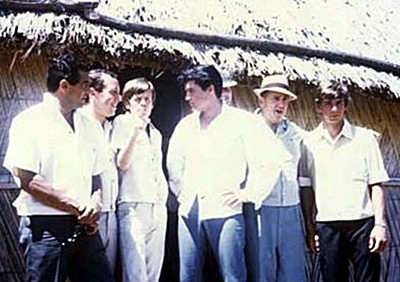 We could see that Elvis was in the centre of the riders as they roared onto the film set. What an entrance...."
Interview by Peter Noone (shown right with Elvis) plus Hawaii DJ Tom Moffet. 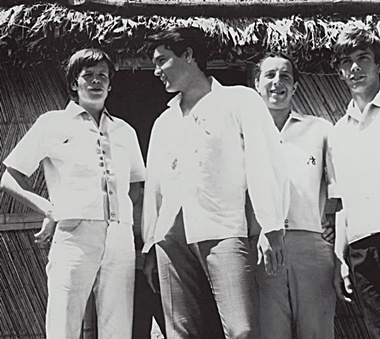 In the summer of 1965, Herman’s Hermits had just finished a big tour of America in Hawaii. "We were booked to fly home the next day," says original member Barry Whitwam. "But that night after the last show we got a telephone call from Colonel Tom Parker – and he said that Elvis Presley would like to meet Herman’s Hermits on his film set the next day. "Peter and I managed to change our tickets home for a flight 24 hours later. Karl, Keith and Derek chose to fly home missing the chance of a lifetime." 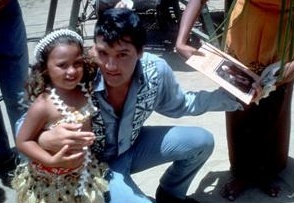 "As Elvis approached us I was spellbound, it was as if God had come down from heaven. We had about two hours with Elvis and talked about our tour of America. He knew we had millions of fans there but I don’t think he really understood why! "Elvis seemed to want to know what our secret was – how five young lads from Manchester could make such a big impact around the world. "At the end of the meeting we had some pictures taken with Elvis, and I have a large framed photo of Elvis and me mounted on my wall at home." ... Let's set the record straight. They called Colonel wanting to meet Elvis, not the other way 'round. Secondly, we did not ride motorcycles in Hawaii we used cars, we were already on the set when Herman and The Hermits showed up. I might add they made a fool of themselves especially when Peter tried to get Elvis to say they were his favorite group. 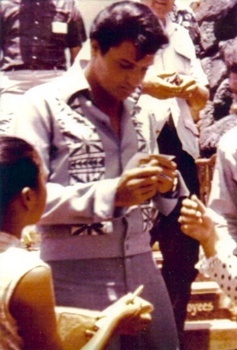 The interview took place on August 18th 1965 at Hawaii's Polynesian Cultural Centre at the wrap-party for the end of filming Paradise Hawaiian Style. 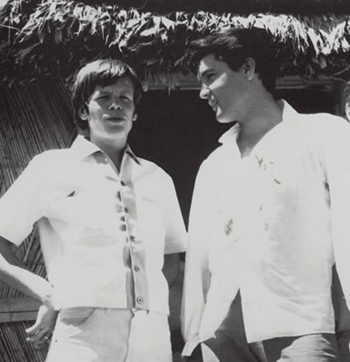 Peter Noone was lead singer of the UK sixties band Herman’s Hermits that was performing in the USA in 1965 and one day met up with Elvis on the set of Paradise Hawaiian Style. The meeting was facilitated by film producer Sam Katzman. Interviewers are Peter Noone of Herman's Hermits, Hawaiian DJ and friend of Elvis Tom Moffet. 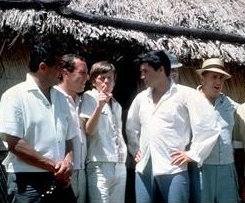 Col Parker; Herman (Peter Noone) can you get close to Elvis so we can get a picture while you're talking? 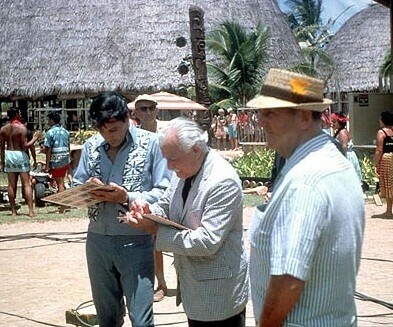 Tom Moffet: On the set of Elvis' latest motion picture, being filmed in Hawaii. Elvis, come over here. I'd like you to meet a young man who's an admirer of yours, and has been for many years. Elvis Presley, this is Peter Noone. Peter Noone: How do ya do? Peter N: Nice to meet you. Tom M: I thought for a change, we've talked to Elvis many times and also talked to Peter on this recent trip - maybe you'd like to ask each other some questions. Peter N: Yeah, when are you coming to England? Elvis: Ah, coming to where? Ah, excuse me. Coming to England.. I don't know. Maybe in a year or so. Peter N: Great! Everyone keeps saying, you know, "C'mon, when's Elvis coming over to England?" It's headlines in the newspaper every week, when are you coming, but you never seem to come. Elvis: Yeah, well Colonel Parker has a bad back, and so forth. Col. Tom Parker: Yes sir! Yes sir! Elvis: (laughing) And as soon as he starts feeling better, we'll probably come over. Peter N: Good. Someone else ask a question now. 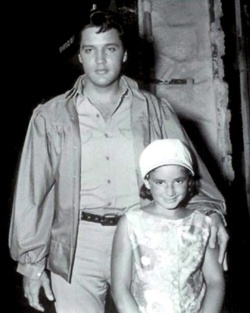 Tom M: Anything you'd like to know about Elvis that you don't know already? Peter N: How come you made it without long hair? Tom M: Herman's asking, Elvis, how come you made it without long hair. It used to be quite bit longer, didn't it? Elvis: Flashback.... Nah, the sideburns did it, I think. Elvis: The sideburns did it. Peter N: Oh I see, sideburns. Elvis: Yeah. You remember those, don 't ya? Peter N: Yeah, everyone’s laughing now, they are. Elvis: We just can't help it, we're all crazy! Peter N: The sun, is it? 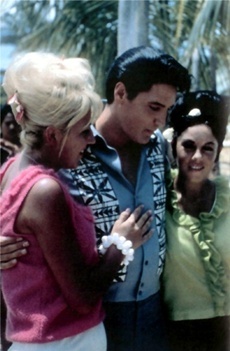 Elvis: We sit here in the sun, I guess it gets to your headafter a while (laughs). Your head, your hair, your.... Tom, that’s probably the best interview you’ve ever had. Peter N: Thanks a lot! Tom M: Pretty casual. I'll let you guys do the work. Peter N: These guys.. in the hot sun. You work in the hot sun all day? Elvis: How'd your show go, Peter? Peter N: Who's your favorite group, after the Beatles? Elvis: Well, after the Beatles I would have to say, (laughing) I'll say.. The Boston Pops, okay! And then the Boston Symphony. (Laughing) orchestra... Nah, I would say your group, The Rolling Stones. 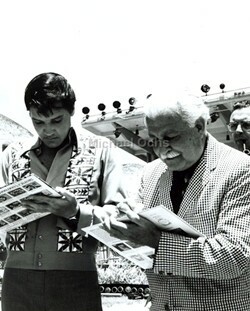 EIN NOTE - Elvis mentions "The Boston Pops" in the interview as his favourite because he had just met Boston Pops lead conductor Arthur Fiedler on the set of the movie wrap-party. 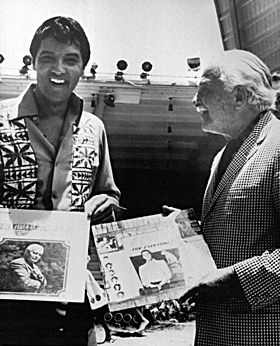 At the time Elvis signed ‘Elvis For Everyone’ his current RCA album for Fielder, while Fielder in turn autographed his latest RCA album for Elvis! Several photographs were taken of the event. See right & below. Marty Lacker: The L.A. Police Department? Col Parker: Yes sir! Yes sir! Peter N: What is filming like? Do you have to get up at six o'clock? Peter N: You start at six? Peter N: Nice weather anyway. What happens when it rains? Elvis: Six, Seven, eight. Huh? Peter N: What happens every time it rains here? Elvis: We have to stop and come inside. Every time a little rain cloud comes over, "click" we stop! That's why we do a "cut". No, we stop and come inside. Marty L: We let our brains cool off. Elvis: Yeah, when it rains, we let our brains cool off a while. So how’d your show go over here? Elvis: How did the show go here? Peter N: I'm sorry, I can't understand everything. It went fabulous, the show you mean?. You know, some of the (american) language I can't pick up. Can you understand me? Col Parker: Yes sir. I gave them all the gifts, Elvis. Peter N: Oh yeah, thanks for all them doofers. Elvis: Oh, you're very welcome...... all those what? Peter N: "Things", you know. Doofers are things. Elvis: Uh, okay! I'd like to wish you the best of luck really. Peter N: Thank you very much. All the best. Elvis: Thank you. All the best to you. Peter Noone: Every time I mentioned records to Elvis, he seemed to dodge the question. I told him that many people in Britain wondered why an old disc like 'Crying In The Chapel' had been released, and I asked him about this, but he avoided answering. Q. Were you disappointed or surprised when you first met Elvis? Peter N: No. He looks EXACTLY like he appears on films and was perfectly natural, apart from the fact that he was wearing his film makeup. He is about the same height as I am, possibly an inch or two taller, and he was wearing the type of clothes that Tom Jones usually wears. We talked for about an hour, about an awful lot of things, but there were times when neither of us knew what to say. Colonel Parker always came to our aid and managed to think of something. There are always lots of people with Elvis. There are five blokes - not really bodyguards - who are always around. But Colonel Parker told me that sometimes Elvis disappears for two or three days without telling anyone, and they never know where he's been. Q. What about his films. Peter N: I did ask him a few questions about films, but he discreetly avoided answering. Colonel Parker protects him all the time. He listens to everything Elvis says, and he won't let him be photographed except by his own photographers. We also talked about touring and Colonel Parker told us about the time when Elvis used to tour. Q. Does Elvis appear to be a lonely person? Q. What are the chances of Elvis coming to Britain? Peter N: Elvis said that he really wants to come, but he would have to go all over Europe and Australia, too if he did. But the thing is that Colonel Tom couldn't go at present. He's been very ill. At the moment he has to wear a steel brace in his back, and he could not undertake such a long tour. Elvis says that he would not go anywhere without him. So we'll just have to keep our fingers crossed. THE mid-60s music scene was dominated by British groups, three of which became household names – The Beatles, The Rolling Stones and Herman’s Hermits, who for a time were one of the most successful groups throughout the world. From their beginning in Manchester, on April 1, 1964, Herman’s Hermits has chalked up more than 23 top 20 single records, 10 hit albums, three major movies and countless television shows and concert tours, with record sales topping 75 million. Since 1971 and the departure of Peter Noone to pursue a solo career, the group has never stopped and on October 17 2011 they come to Liverpool UK at the Phil as part of the Sensational 60s Experience tour. “It’s going to be a lot of fun,” says Barry. “We always get a great audience in Liverpool. Right back from when we used to play The Cavern in the 60s, we’ve always liked Liverpool and the friendly people. Click here for more info about Herman's Hermits 2011 Tour. Photo right copyright by Michael Ochs - as noted.